Earlier this morning the Gurn was alerted to the fact that someone or some group/organisation had been cutting the broom along the Links yesterday between the Sandancer and the Links car park. Upon arriving in the area it was obvious that a large patch of broom had been clear-felled and left by the path. Yesterday a worried gurnite and her friend remonstrated with the cutters, they were worried about the effect on birdlife. The cutters were unmoved by this and continued. Do the left over stumps present a danger to walkers or children playing in the dunes? Do you enjoy the spring and early summer colours along this part of the seafront? Perhaps you won't have the chance next year. 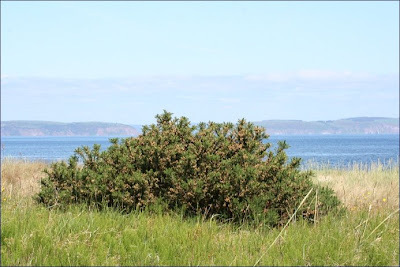 Could this clump of gorse be next for the chop? 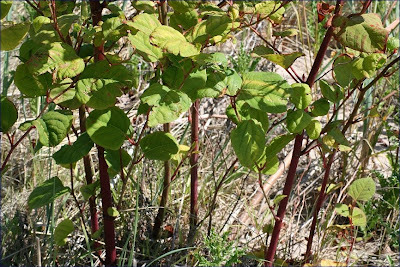 Further along the beach, Japanese Knotweed ( a plant that has devasted areas of the riverside) grows unmolested as the broom is destroyed further along. Please e-mail the gurn if you have any details about why the broom was cut and who is carrying out the work. As this area of scrub is presently occupied by a variety of nesting birds.Surely this is completely out of order. This is unlikely to be the council if the work was done on a saturday ? These bushes are used constantly by the birds for nesting and shelter, and are the only splash of colour during the early part of the year. I hope you find out who and why this has happened. would this not be the doing of the council? No idea who is doing it I am afraid. Does the local council know? The local community councils? Any experts out there who might like to tell the Gurn about the link between wildlife and the plants that grown alongside the shore? Please ask your councillors to find out Gurnites! Now instead of zapping the broom perhaps the knotweed could be dug up? 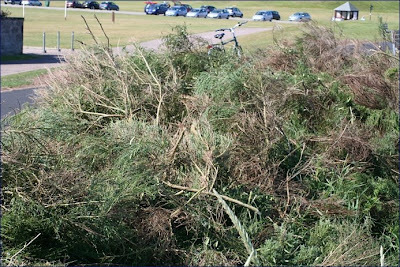 Looks like the dunes are being sanitised with the removal of the gorse and whin bushes; but who is behind such lunacy? A disgrace, this is a wonderful walk in the spring with snow still on Ben Wyvis contrasted against the colours of the sea and sky and the patches of broom and gorse on the edge of the dunes. Paradise lost? I didn't see it myself, but I understand there was a "ranger" type person with the folk who were doing the cutting... so possibly this was done under the auspices of Highland Council's Countryside Rangers (a Ranger plus volunteers?). Maybe we should contact Katy to ask if the Council's Rangers know anything about this? 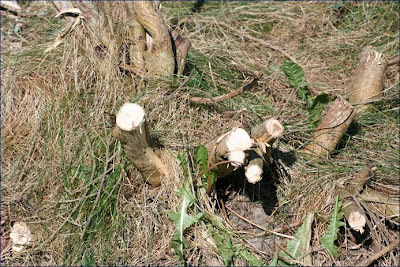 By looking at the height of the stumps that remain,it is obviously someone who hasn't a clue about what they are doing.Or the damage to the wildlife. We don't know who was in charge. So perhaps we'll publish your post later if more information emerges. From what i heard of the squad that was doing the cutting, this might be a community service lot doing their thing ? Pity they did'nt pick up all the litter instead ! jayteescot1's most recent comment may have got it right. At the last meeting of the Ward Forum, an official from the Council's Inverness offices responsible for offender-rehabilitation projects drew attention to their programme of community-service work. He said they were aiming to do more work in Nairn. Boomschtick,I think you and JT are very much on the wrong track with the community service angle but perhaps it is worth bearing in mind that they are indeed looking for more work in Nairn. If they were to go and tackle the Japanese Hogweed and other invasive species up the river they certainly would be doing this community a service and the Nairnshire ecology too. However back to the question in hand and is it not those that organise these things that we should be questioning? The individuals taking part might have thought they were in fact doing something of benefit to the local environment. Without the rationale behind the exercise it is hard to debate the issue. Whatever the organisers’ objectives, if they were indeed ecological, other factors need to be taken into account such as amenity. If people enjoy looking at broom in the spring then should it stay or should there be a compromise after debate within the community? What is worrying is that no one seemed to know that this was going to happen thus it comes as a shock to people. The question still remains: will this be an ongoing activity and will other areas of the town green spaces be hit? The Gurn heard recently that the spruce trees along the walk between the Sewerage Bridge and the Bailey Bridge were to be felled/replaced. It indeed seems there had been some sort of proposal (one councillor believed that it would be going ahead) but it hasn’t in reality got off the drawing board yet. The Spruce trees for example are non-native but they are becoming Nairn landmarks in their own right. During the spell of prolonged heavy frost last winter they were a stunning sight. In the future some of them may need to be felled to allow the others to achieve their full potential, but now the non-native and native tree species coexist happily along that walk, giving sufficient room for growth of a fantastic display of honeysuckle and dog roses, giving shelter and food for wildlife. Getting off the point a bit, but please a plea for the authorities for more consultation on projects they may have in the pipeline. After all, we are now in an age of greater transparency aren’t we? Just talk to the people of Nairn and drop the institutional arrogance/ignorance and the attitude that you know best!